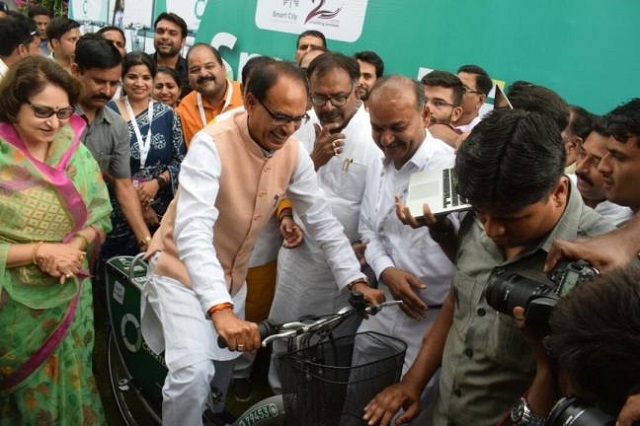 On Sunday, June 25th, Bhopal, the capital of Madhya Pradesh, launched India’s first fully automated bicycle sharing system as part of the second anniversary of its much-talked-about smart cities program. This development comes just three weeks after Mysore launched the country’s first city-level bicycle sharing project. The Public Bicycle Sharing system, or PBS, developed with the help of WRI, involves a fully automated system of 500 bicycles with over 50 docking stations across Bhopal, backed by a state-of-the-art IT system. As part of this completely automated system, users can pick up a cycle from any of the stations and deposit it at another without worrying about returning it to its original location. 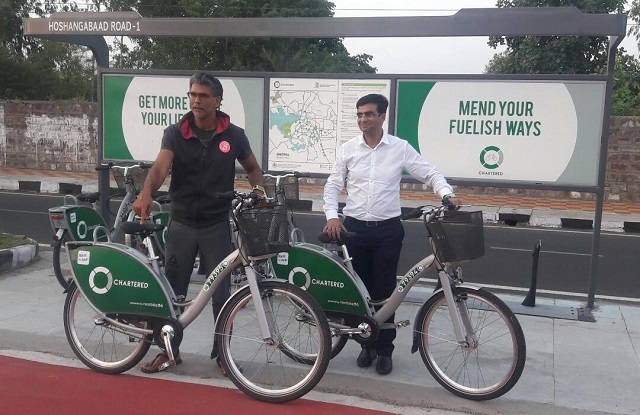 The Bhopal Bike sharing system is the country’s first integrated and fully automated bicycle sharing system that connects MyBus, Bhopal’s bus rapid transit (BRT) system, with key residential and commercial nodes. By providing both first and last mile connectivity to the city bus system, it improves its efficiency. In addition to service integration, the city offers flexible payment options, with one smart card that works for bike sharing, BRT and bus services. Bhopal City Link Ltd. is the single nodal agency that will oversee the operational monitoring of all three, making it a great example of institutional integration of public transport modes. Pedestrians and cyclists comprise the largest number of road traffic crash victims in Indian cities. Many cities are therefore wary about developing cycling facilities due to fears they will only put more people in danger. But as part of Bhopal’s bicycle sharing project, the city is also developing physically segregated cycle tracks in the city. At launch there are 12 kilometers of five-meter wide tracks, the country’s widest physically segregated bicycle lanes. The city is also developing 55 kilometers of additional non-motorized transport paths, with work expected to start shortly. PBS is not a one-off project for Bhopal, but part of a targeted campaign to promote walking and cycling. It is hoped that what Paris’s Vélib’ system did for bicycle sharing in Europe, Bhopal PBS can do for India. The effort kicked off with Raahgiri Day in September 2014 with major street closures to promote more pedestrian and cycling traffic. The resounding success of Raahgiri demonstrated that people were ready for another look at cycling. The city is now using the concept of “tactical urbanism” to reimagine streets and public spaces so that they can be more people friendly. Bhopal is also in the initial stages of planning its first “smart street” project as part of this initiative, which will involve retrofitting an existing 1.5-kilometer stretch with dedicated facilities for walking and cycling along with other urban design features. Much will depend on the operation and implementation of PBS going forward, but the early signs are good. 2017 is the 200th anniversary of cycling in the world. With the help of innovative efforts like PBS, this humble mode of transport is gradually coming back to help make India’s cities more pleasant, cleaner and safer. Sarika Panda Bhatt is Manager of Cities and Transport with WRI India. Chandramauli Shukla is the CEO of Bhopal Smart City Development Corp Limited. Amit Bhatt is the Director of Integrated Transport at WRI India.